The concept of class action lawsuits was based on noble intentions – allowing a group of similarly aggrieved claimants to take legal action against the same defendants in a single case. This was meant to improve the efficiency of the civil justice system by having a single class action lawsuit, as opposed to potentially thousands of separate lawsuits across the country. However, today, many class action lawsuits are not pursued to seek justice for harmed consumers. Instead, they are treated as a litigation tool to gin up legal fees and discourage a corporate defendant from going to trial and opting for a large settlement. A prime example can be found in Eike v. Allergan, Inc., 2017 WL 881834 (7th Cir. March 6, 2017). This case involved plaintiffs suing the manufacturers of eye drops developed to help treat glaucoma because the drops were allegedly “bigger” than they needed to be for the average consumer. No one was blinded or suffered an infection or any other physical harm. The plaintiff’s legal theory was that consumers were being forced to pay more for these drops than they would have been if the eye drops were manufactured to be smaller. Counsel for the plaintiffs did not allege foul play between the corporate defendants and did not allege that the manufacturers misrepresented the contents of their product. Instead, counsel for the plaintiffs simply asserted that a smaller dose eyedrop product (that no company made, by the way) would save consumers money. This lawsuit shares many similarities with the highly publicized Starbucks class action lawsuit where the plaintiffs alleged that Starbucks misrepresented the size of its iced drinks due to the amount of ice in each cup. The federal judge in the Starbucks case quickly dismissed the lawsuit since it had “no weight,” according to Law360. Fortunately, a similar conclusion was reached in this eye drop case. In an act of sheer bewilderment, the Southern District of Illinois decided to certify the eye drop class action lawsuit. Fortunately, that certification did not last long when it was appealed to the Seventh Circuit. Judge Richard Posner reviewed the case and quickly reversed the district court’s certification of the classes. He also ordered that the case be dismissed with prejudice for lack of standing. Judge Posner’s opinion excoriated the supposed logic underpinning the lawsuit. He saliently pointed out that there is nothing unscrupulous or wrong with selling bigger eye drops. In fact, smaller eye drops may actually harm consumers more since they may not be able to get enough of the active ingredients into their cornea and/or they would be forced to pay more to get multiple smaller eye drops as opposed to a single larger eye drop. Judge Posner also astutely pointed out that the bigger eye drops were approved by the U.S. Food and Drug Administration (FDA) and the courts cannot simply bypass a federal agency and make an independent assessment of the safety and efficacy of eye drops. As you can see, many companies are subjected to highly questionable lawsuits filed by plaintiff lawyers looking for a big settlement or jury verdict. That is why you need an experienced and aggressive law firm to stand up and defend your company’s reputation. The Brownsville law firm of Colvin, Chaney, Saenz & Rodriguez, L.L.P. 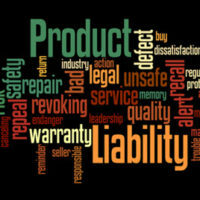 provide skillful representation to product manufacturers facing any type of liability claim. Contact our office to learn more.